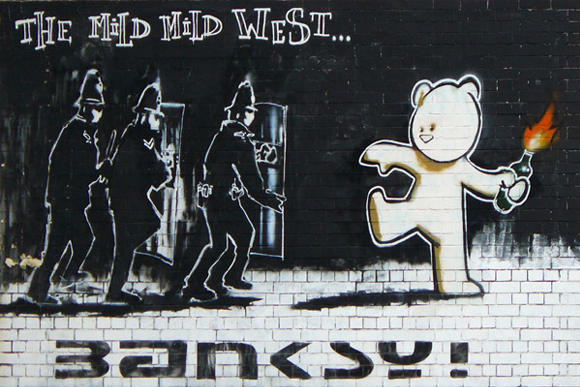 The graffiti is in Stoke Croft in Bristol in England; his name is The Mild Mild West and it’s painted by Banksy in 1999. The graffiti represents three riot policemen approaching a big teddy bear holding a Molotov cocktail in the hand, the riot policemen advance behind protective by shield. In the top, we can see the name of the work and at the bottom we can see the name of the street artist. I think it’s about the violence of the city of Bristol where at the time the district is disadvantaged and a specific trigger for the mural was such an event at winter stokes Road, where riot police began to attack partygoers. I like this work because the graffiti is funny; a teddy bear is normally harmless and soft.